I started a new job recently. And honestly. I am struggling. Some days I think I can do the job. Other days, I’m filled with doubt. The days and weeks have been filled with training. So much training. Then slowly I’m getting work assignments with lots of hand holding. At some point, I will be on my own. I’ll be juggling many tasks and clients and deadlines. I don’t know how others do it. But they seem to. And I think if they can do it, surely I can. Can’t I? Then I remember. God provided this job. He wouldn’t give me a gift that I can’t do. Right? And then I remember. No. I can’t do it on my own. 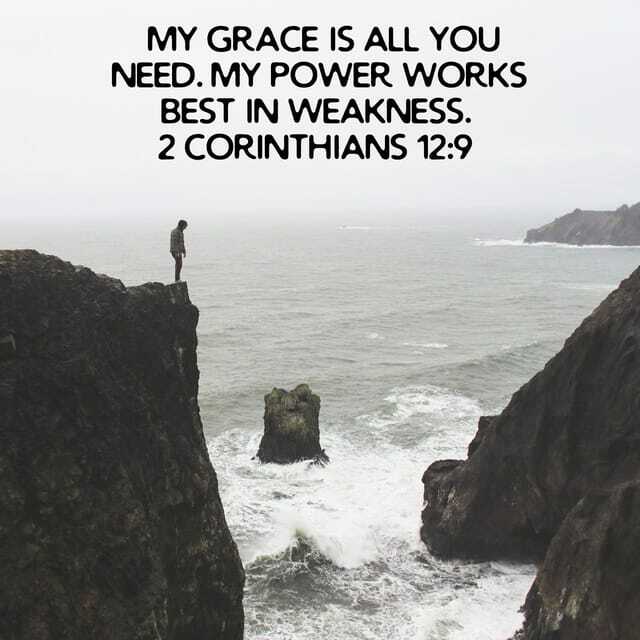 In my weakness, I need to trust Him. I need to lean on Him. I need to call on His name every day and trust that He will equip me for that day. Oh. I try not to look ahead. That’s when I become fearful. How can I do all that I’ll be assigned to do in the days ahead. It’s then I remember that He gives mercy just for today. I need to focus on today and the tasks for this day only. I must remember that He said I am equipped for the job. He will help me. Oh. Trust is easier said than done. When in a tight spot, trust is just a word. Not an act. But when I act on that word. When I trust God, I know all things are possible. I know that in my weakness, God’s power will calm me. And guide me through the anxious moments. There is no match for the power of Christ. Oh. It sounds like an oxymoron. Strength in weakness. How can I be strong when I feel so weak? How can I be powerful when I feel powerless? How can I succeed when I feel like a failure? How can I act confident when I feel insecure? Why do I want something other than what I’ve been given? When I know who the Giver is. And I know the gift is for this time in my life. Why do I struggle with this gift? It wasn’t quite what I expected, but it’s what I’ve been handed. So I must go forward and make each day count. Oh. The struggle is real. He says. You must trust me, but I will let you fight. I say. Show me your power, lest I get lost in my weakness. There is One. One who has conquered that fear. One who has overcome failure. One who has choked insecurity. One who has all power. He even conquered death. I want Him on my team. Always. If I’m choosing teams, I choose His. Why? Who doesn’t want a miracle maker on their team? Who doesn’t want an encourager? A helper. I choose the army of God. Father, thank you for going before me to open doors. Thank you for staying with me to hold me steady. Thank you for going behind me to protect me. You surround me with your love and goodness. Your faithfulness is ever present. Your mercy reaches down and calms my fears. Yours is the power and glory forever. Amen.